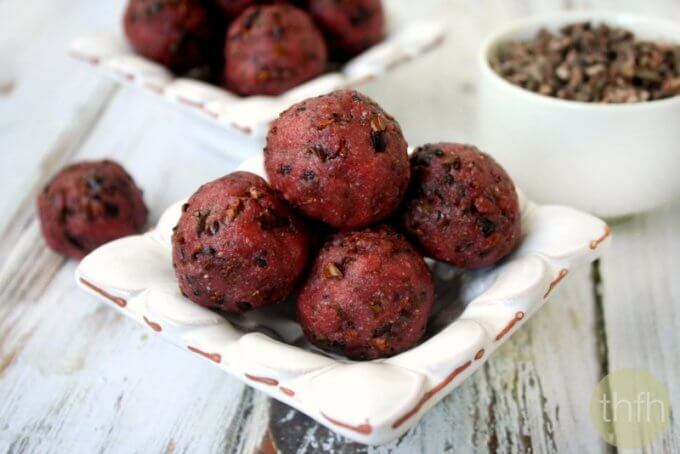 As we enter into the week before Valentine’s Day, I have these Cacao Nib Superfood Truffles to share with you that gives you a healthier treat or gift-giving option. And in doing so, I’m really excited to introduce and welcome a new superfood to my superfood pantry…Baobab Powder! If you’ve never heard of it, don’t worry…I had never heard of it either until I was introduced to it by Vivapura Superfoods. Baobab Powder is also called “The King of Superfruits” and for good reason. What is Baobab? Baobab is a tree native to certain regions in Africa. It produces a tropical fruit with a powdery pulp that is made into Baobab Powder and offers numerous health benefits. Exceptionally high in fiber and antioxidants, Baobab Powder helps to minimize inflammation in the body and support healthy immune function. It is 50% fiber by weight and contains more antioxidants than blueberries or acai. Baobab powder is also exceptionally high in Vitamin C and calcium, and contains more potassium than bananas! It has a light tangy flavor that is perfect in all of your smoothies, juices and raw or baked citrus dessert recipes. Another thing I really liked about this brand is the Vivapura Superfoods Baobab Powder is organic, raw, vegan and non-GMO Project Verified…and you really can’t ask for more than that! When I was asked to create a new recipe using Baobab Powder, I knew I wanted to make something raw to keep the Baobab Powder in it’s raw state, so decided to make a superfood truffle and added some beet juice to give them a pretty reddish color. This is a really simple recipe that can be made in matter of minutes using just a food processor and it’s raw, vegan, gluten-free, dairy-free, no-bake, paleo-friendly and contains no refined sugars! 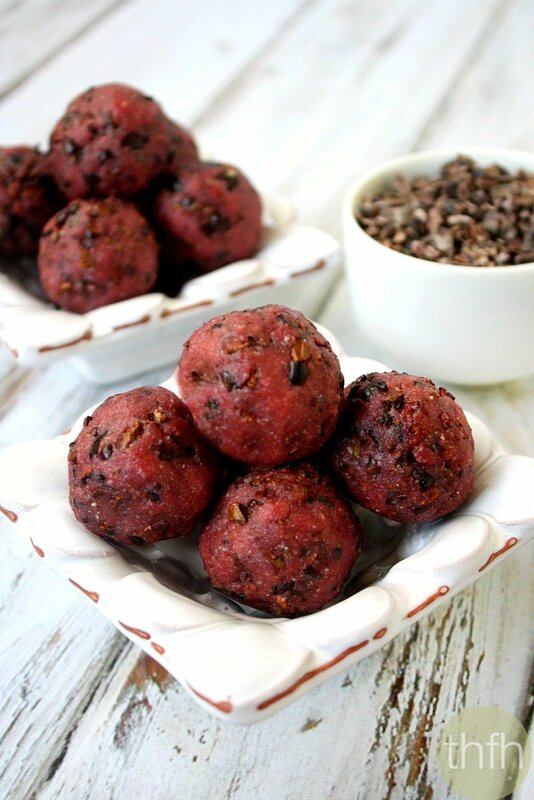 Want more healthy truffle and ball recipes? Check out my Crunchy Raw Protein Balls, Pistachio Sesame Seed Balls, Pistachio and Matcha Truffles or my Clean Eating Cookbook which has an entire chapter of 20 truffle and ball recipes just like this one that you will love! Tip #1: I used homemade cashew butter using 100% organic raw cashews but feel free to use your favorite. If you do make your own cashew butter, you will need (3) cups of cashews to make (1) cup of cashew butter. Tip #2: I added fresh beet juice to give it the pretty reddish color, but you can omit it if you prefer. Tip #3: I used organic raw cacao nibs but if you don’t like the taste of cacao nibs or don’t have any, you could also use Enjoy Life mini-chocolate chips (non-GMO/gluten-free), but they wouldn’t be “raw”. Step 1 Optional: Make your own cashew butter (Add 3 cups of cashews to a food processor and process until they turn into a creamy nut butter texture. This will take between 5 - 10 minutes so stop every couple of minutes to scrape the sides of the food processor keep going until it gets creamy). Add all ingredients (EXCEPT the cacao nibs) to a food processor and process until everything is well combined. Transfer the mixture to a medium sized bowl, add in the cacao nibs and gently stir them in. Take out a spoonful at a time, squeeze the mixture tightly in your fist several times until it is compact and shape it into a ball shape with your fingertips. Put them in the freezer for approximately 15 - 30 minutes, or until they harden then store them in the refrigerator until ready to serve. Keep them in the refrigerator until ready to serve because they will become soft and lose their shape if left out at room temperature. This recipe will make approximately (12) truffles. Cacao Nib Superfood Truffles recipe and photographs by The Healthy Family and Home is licensed under a Creative Commons Attribution-NonCommercial 4.0 International License. Miscellaneous Disclosure: I received products from Vivapura Superfoods to use in creating a new recipe. I was under no obligation to give a positive review and was not paid for this review or endorsement. All thoughts, opinions and comments are my own. I haven’t heard of baobab powder before but sounds like it’s a great superfood! I love all the fast facts you share about the ingredients! 🙂 These truffles are now on my Recipes To Try list.